Future communication systems are driven by the concept of being connected any-where at any time. This is not limited to even in medical area. Wireless medical communications assisting peoples work and replacing wires in a hospital are the applying wireless communications in medical healthcare. The increasing use of wireless networks and the constant miniaturization of electrical devices has empowered the development of wireless body area networks(WBANs).In these networks various sensors are attached on clothing or on thebody or even implanted under the skin. These devices provide continuous healthmonitoring and real-time feedback to the user or medical personnel. The wire-less nature of the network and the wide variety of sensors offer numerous new,practical and innovative applications to improve healthcare and the quality of life.The sensor measures certain parameters of human body, either externally or internally. Examples include measuring the heartbeat, body temperature or recording a prolonged electrocardiogram (ECG). Several sensors are placed in clothes, directly on the body or under the skin of a person and measure the temperature, blood pressure, heart rate, ECG, EEG, respiration rate, SpO2 levels etc. 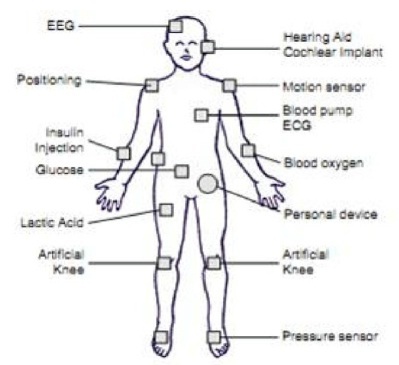 Next to sensing devices, the patient has actuators which act as drug delivery systems. The medicine can be delivered on predetermined moments, triggered by an external source or immediately when a sensor notices aproblem. The sensor monitors a sudden drop of glucose, a signal can be sent to the actuator inorder to start the injection of insulin. Consequently, the patients will experiences fewer nuisances from his disease. An example of a medical WBAN used forpatient monitoring. A WBAN can also be used to offer assistance to the disabled. For example, a paraplegic can be equipped with sensors determining the position of the legs or with sensors attached to the nerves. In addition, actuators positioned on the legs can stimulate the muscles. Interaction between the data from the sensors and the actuators makes it possible to restore the ability to move. Another example is aid for the visually impaired. An artificial retina, consisting of a matrix of microsensors, can be implanted into the eye beneath the surface of the retina. 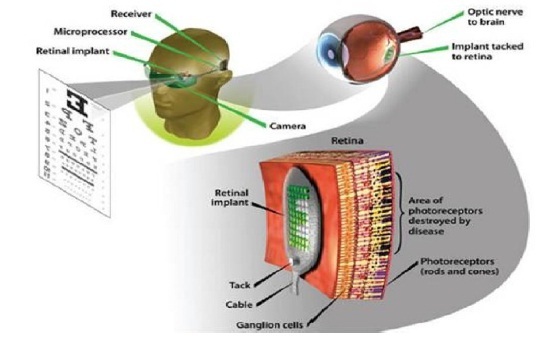 Theartificial retina translates the electrical impulses into neurological signals. Another area of application can be found in the domain of public safety where the WBAN can be used by firefighters, policemen or in a military environment. The WBAN monitors for example the level of toxics in the air and warns thefirefighters or soldiers if a life threatening level is detected. The introduction of a WBAN further enables to tune more effectively the training schedules of professional athletes. Intra body communication controls the information handling on the body between the sensors or actuators and personal device. And extra body communication ensures communication between the personal devices and an external net-work . This segmentation is similar to the one defined in where a multi-tiered telemedicine system is presented. Tier 1 encompasses the intra-body communication, tier 2 the extra-body communication between the personal device and the Internet and tier 3 represents the extra-body communication from internet to the medical server. 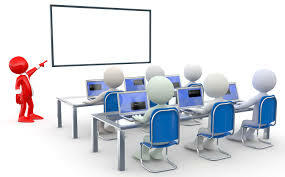 To date development has been mainly focused on building the system architecture and service platform for extra-body communication. Much of these implementations focus on the repackaging of traditional sensors (e.g. ECG, heart rate) with existing wireless devices. They consider a very limited WBAN consisting of only a few sensors that are directly and wirelessly connected to a personal device. Further they use transceivers with a large and large antennas that are not adapted for use on a body. 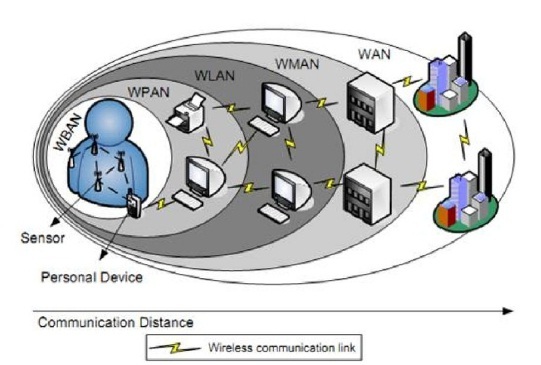 In the figure 4.2, a WBAN is compared with other types of wireless networks, such as Wireless Personal (WPAN), Wireless Local(WLAN), Wireless Metropolitan(WMAN), and Wide area networks(WAN). A WBAN is operated close to human body and its communication range will be restricted to a few meters, with typical values around 1-2 meters. While a WBAN is devoted to interconnection of one persons wearable devices, a WPAN is a network in the environment around the person. 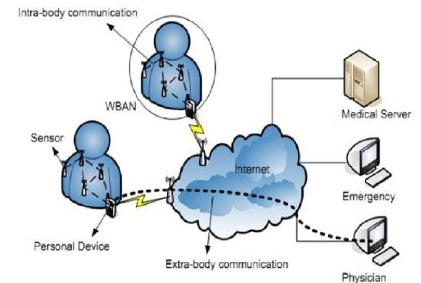 The characteristics of the physical layer are different for a WBAN compared to a regular sensor network due to the proximity of the human body. Tests with TelosB motes (using the CC2420 transceiver) showed lack of communications between nodes located on the chest and nodes located on the back of the patient . This was accentuated when the transmit power was set to a minimum for energy savings reasons. when a person was sitting on a sofa, no communication was possible between the chest and the ankle. Better results were obtained when the antenna was placed 1 cm above the body. As the devices get smaller and more ubiquitous, a direct connection to the personal device will no longer be possible and more complex network topologies will be needed. The characteristics of the propagation of radio waves in a WBAN and other types of communication are as follows. There exists several path loss along and inside the human body either using narrowband radio signals orUltra Wide Band (UWB). All of them came to the conclusion that the radio signals experience great losses. Generally in wireless networks, the transmitted power drops off is defined as P = dn (5.1) where d represents the distance between the sender and the receiver and n the coefficient of the path loss. In free space, n has a value of 2. Other kinds of lossesinclude fading of signals due to multi-path propagation. The propagation can be classified according to where it takes place: inside the body or along the body. The body acts as a communication channel where losses are mainly due to absorption of power in the tissue, which is dissipated as heat. As the tissue is lossy and mostly consists of water, the EM-waves are attenuated considerably before they reach the receiver. In order to determine the amount of power lost due to heat dissipation, a standard measure of how much power is absorbed in tissue is used: the specific absorption rate (SAR). It is concluded that the path loss is very high and that, compared to the free space propagation, an additional 30-35 dB at small distances is noticed. It is argued that considering energy consumption is not enough and that the tissue is sensitive to temperature increase. A WBAN is expected to be a very useful technology with potential to offer a wide range of benefits to patients, medical personnel and society through continuous monitoring and early detection of possible problems. With the current technological evolution, sensors and radios will soon be applied as skin patches. Doing so, the sensors will seamlessly be integrated in a WBAN. Step by step, these evolutions will bring us closer to a fully operational WBAN that acts as an enabler for improving the Quality of Life.